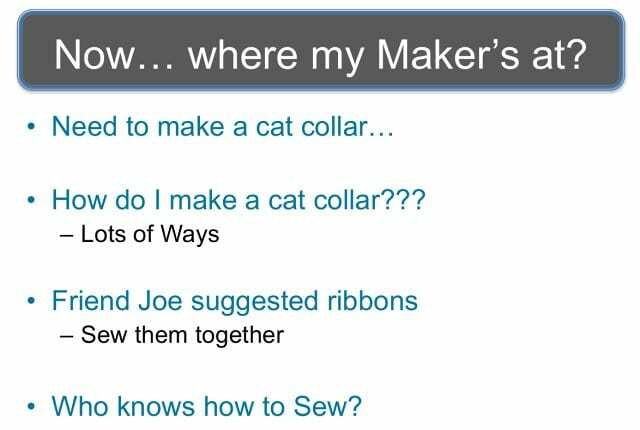 This part of Gene Bransfield’s talk covers the final troubleshooting and gear preparation before the volunteer pets are good to go with the collar. And he explained it to me in a way similar to my rocket science story, which is having drinks in a bar with somebody and this guy joins our conversation and he is a pretty cool guy. So eventually a question comes up: “What do you do for a living?” He’s like: “I’m a rocket scientist.” And I go: “No, seriously, what do you do for a living?” He’s like: “No, seriously, I’m a rocket scientist.” And so, that’s cool. “What do you think about the phrase ‘It’s not rocket science’?” And he’s like: “Well, I laugh at that, because, you know, there’s some science and engineering that goes into building the rockets and putting the fuel in them, but at the end of the day you just put the rocket on the launch pad, hit the red button and hope for the best.” Sometimes it blows up, sometimes it falls over and blows up, sometimes it gets all the way to space and then blows up. The hard part is not getting new rockets – the hard part is getting more monkeys to put in the rockets. Anyway, that’s how you port libraries, as it turns out. 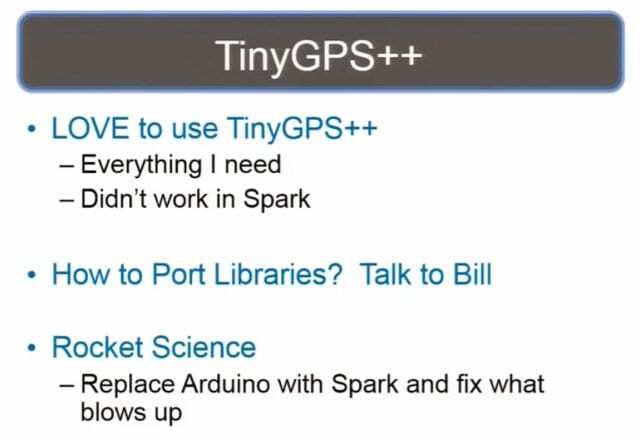 You change the Arduino stuff out with the Spark stuff, you hit Compile, listen to it scream actually, then you go fix what it’s screaming about, and you keep doing that until it doesn’t scream at you anymore. And if the compiler screams at you and you scream back, you’ll only really succeed in scaring your wife. So I did that for a couple of hours – and bam! It works! I have now ported libraries! 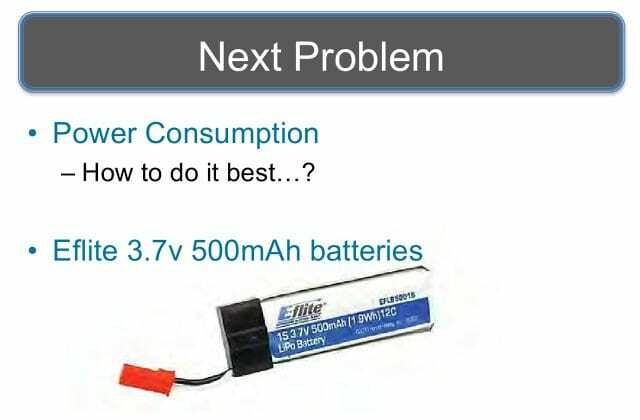 The next problem is power consumption (see right-hand image), and my buddy Ricky Hill hooked me up with the E-flite batteries that are used for model airplane stuff: 3.7v, 500mAh batteries – enough to get the kitty thing going. 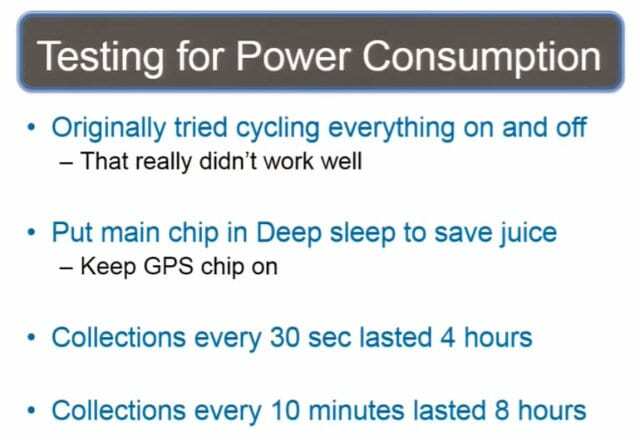 So, now I’m testing for the optimal power consumption, and the first thing you think of is: “Oh, I’ll just turn everything on, get the stuff and then turn everything off.” But remember I told you before that it can sometimes take 2-15 minutes to get the GPS lock, and if you turn off the GPS antenna it loses the satellites. And the cat runs under a bush, and then you burn through your power without getting any data. So I found the best solution for me was to turn the main microcontroller on and off, keep the GPS chip powered, and that worked much better: collections every 30 seconds, the whole solution lasted 4 hours. Every 10 minutes – it lasted 8 hours (see leftmost image below). So, now I have to make a collar. 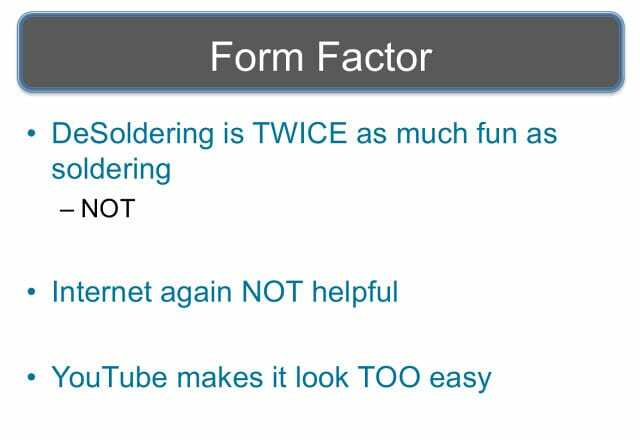 And if you thought soldering was fun, desoldering is twice as much fun as soldering ever was (see middle image above). Oh my God, I destroyed so much crap trying to desolder things. The Internet, again, is not helpful, and YouTube makes everything look too easy. 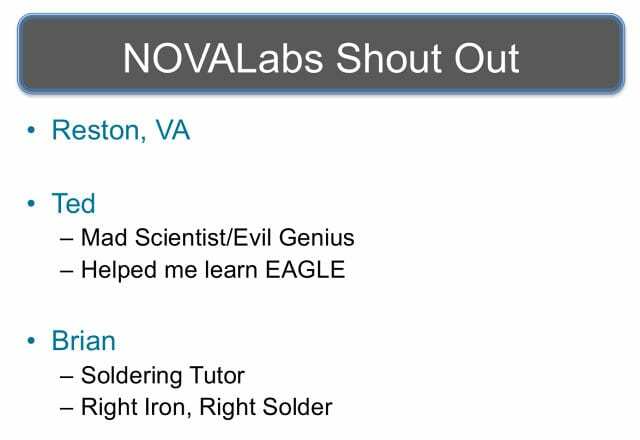 So I talked to my friend Joey, and he said: “Yeah, head out to your local MakerShop and Nova Labs and they will help you out.” So, shout out to Nova Labs in Western Virginia! Ted – mad scientist/evil genius, helped me learn how to do EAGLE; and Brian was my soldering tutor, he showed me the right iron and the right solder and made my life a whole hell of a lot easier (see rightmost image above). Now I actually have to make the collar itself. That’s hard stuff. I don’t know how to make a collar. 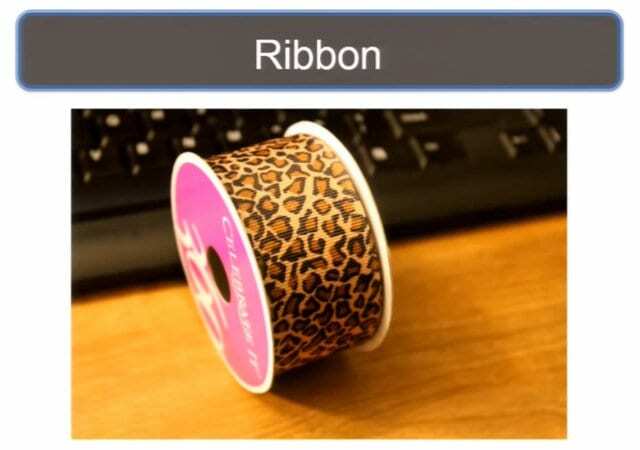 I can go code things and learn how to solder, but this is, like, ribbons… So I talked to my friend Joe, and he’s like: “Why don’t you just get a couple of ribbons and you sew them together, and then you can put your stuff inside of it.” I’m like: “Cool!” So I went down to my gals and I got myself ribbon: “It’s leopard skin print, it’s so in this year for all the cats” (see leftmost image below). But now I need to sew it together. Who knows how to sew? It’s, like, 2014, we don’t sew stuff, we just go buy new stuff. It’s a grandma skill, right? So, what do you do? 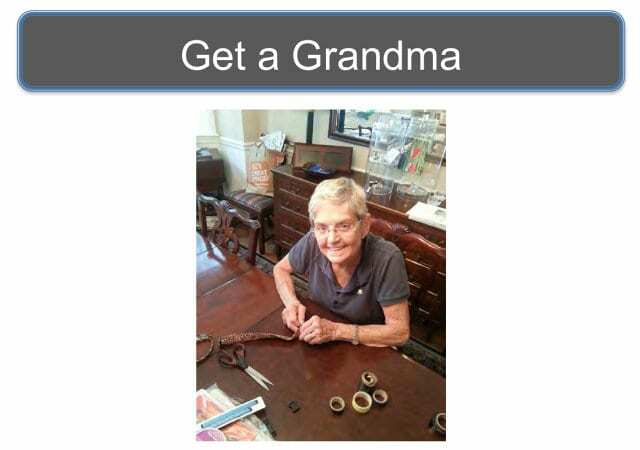 You get a grandma (see middle image above). 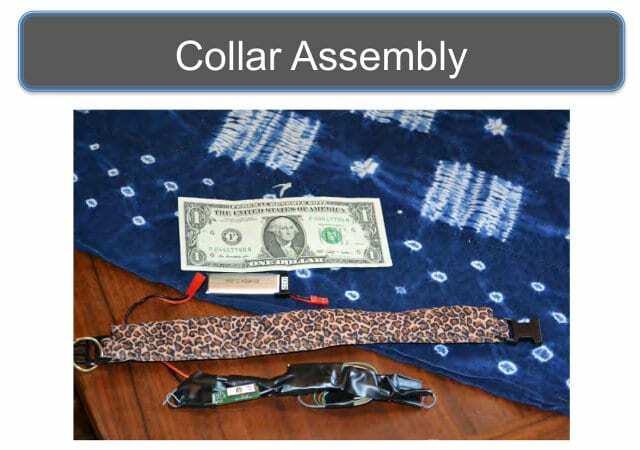 This is my wife’s grandmother, her name is Nancy, she’s “really nice to meet you”, and she was very happy to help me out, and here’s the final collar assembly (see rightmost image above). We have a dollar bill followed by the E-flite battery, the actual collar, and then the components all wrapped up not only to get protected from weather, but the Spark has a lot of flashy bits – I didn’t want to put that on the cat.